Spring finally is here, with summer just around the corner! I don’t know about you but with me I start craving more of the fresh salads and cool smoothies around the same time 🙂 The freshness and crispness of these salads works beautifully with the warmth of the sun. 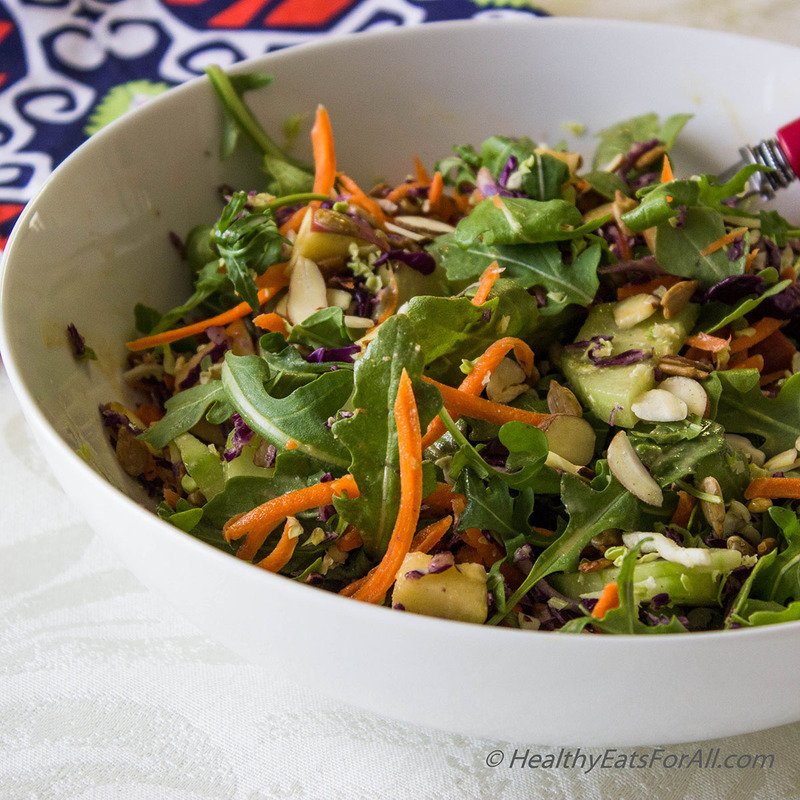 If I can have a spicy, light dressing on top then that’s absolutely heavenly! This salad is wonderful. It is full of contrasting colors, flavors and textures! Not only that, it is rich in fiber and plenty of powerful antioxidants. Antioxidants are substances in raw fruits and vegetables that help protect our bodies from the damage caused by harmful molecules called free radicals. Along with that it turns out to be a low calorie meal that happens to be extremely nutrient dense. Adding nuts not only adds another texture but also serve the purpose of providing the body with healthy monounsaturated fatty acids, also called as MUFA’s. These MUFA’s serve the dual purpose of being improving heart health and protect against chronic diseases. If I have some leftover grilled chicken or tofu at home, I just add it to the salad. But it’s completely optional. In case you have allergies to peanuts, you can substitute Sunflower seed butter for it in the dressing and it will still taste wonderful. 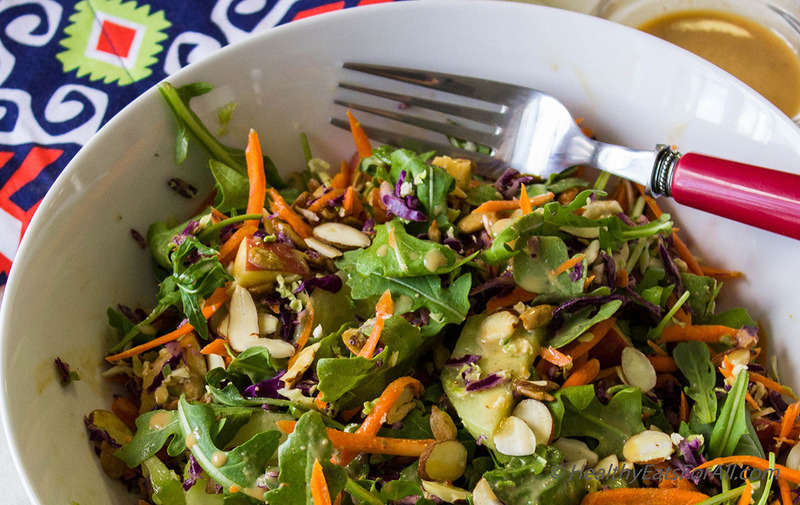 This dressing is super simple to make and you can make it in 5-7 minutes. 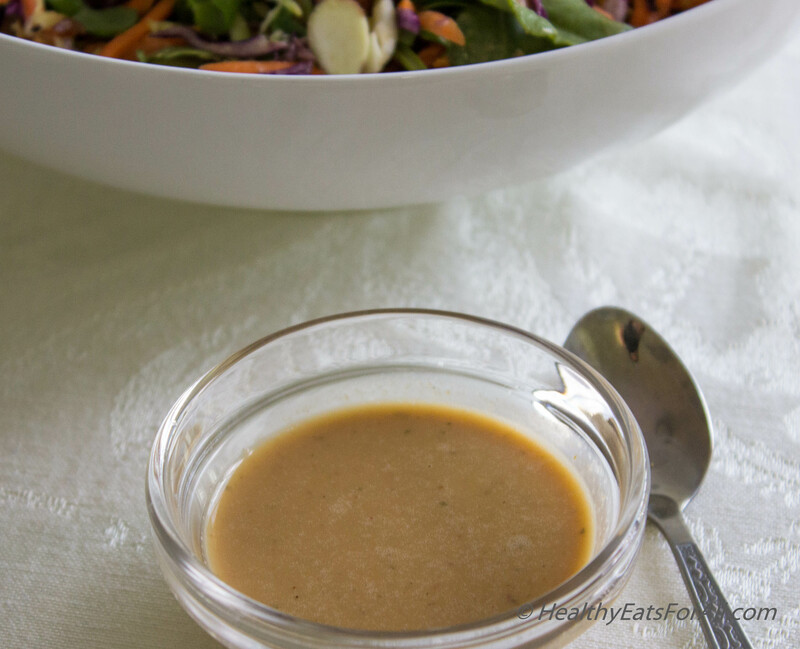 This homemade dressing is so much better than the store bought ones which are super processed with chemicals. They usually have a lot of fat and sugar also. 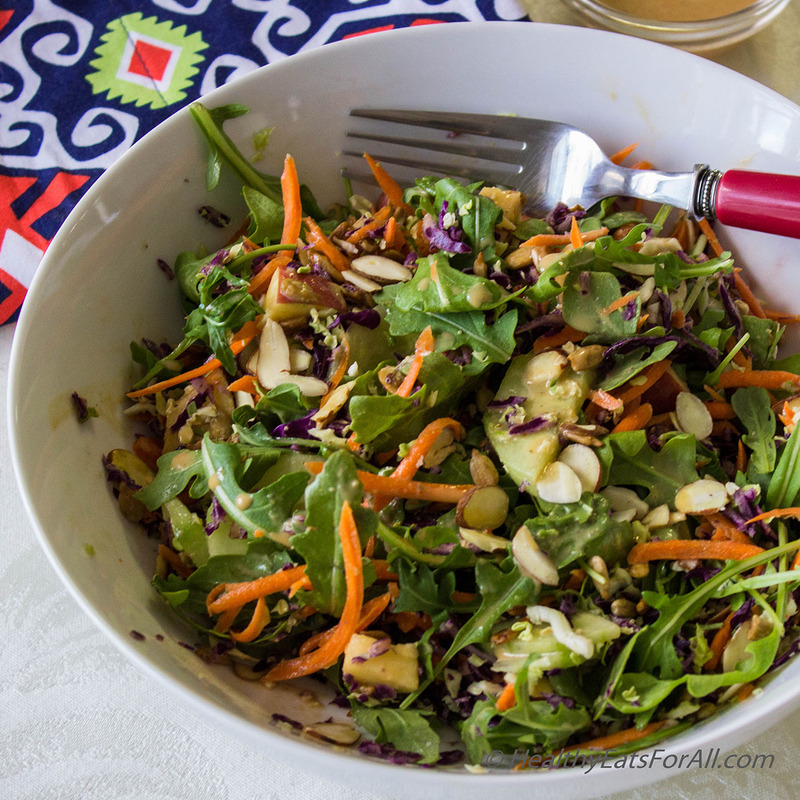 I really hope you try this salad with this spicy, healthy dressing! Using the grater attachment of my food processor I grated the carrots, Brussels sprouts, red cabbage. Slice the cucumbers and chop the apples. Add the ingredients for the dressing to an empty jar/bottle with lid and shake vigorously. If you don’t think it has mixed properly, you can use a whisk or a blender. 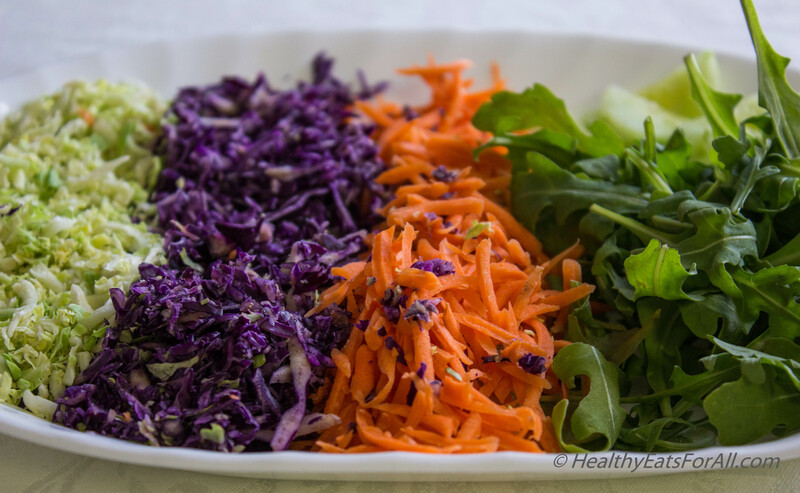 Add about equal amounts of veggies for the salad in a big bowl. Pour about 2-2 ½ T of the dressing. 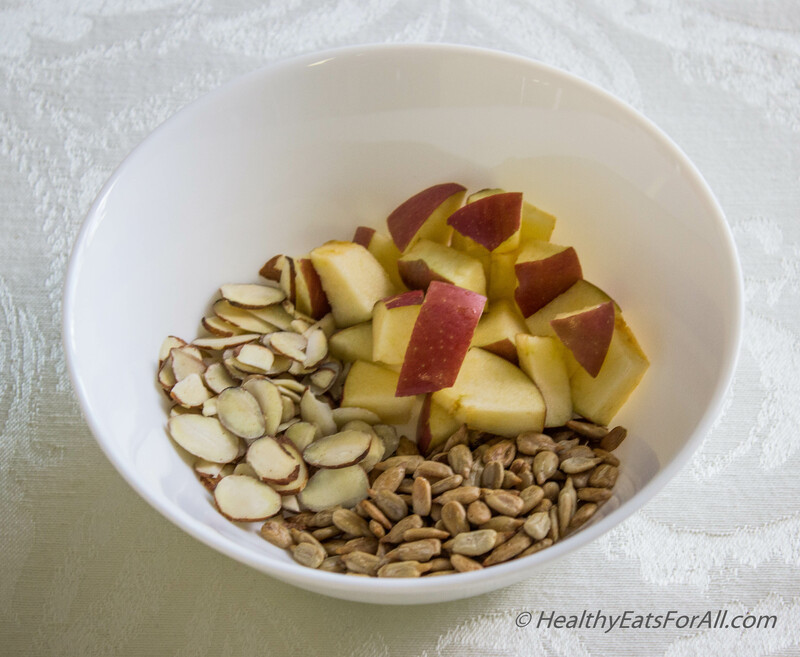 Sprinkle a tablespoon of sliced almonds and sunflower seeds. Total Servings: 20 Tablespoons approx.